This unique collection of 200 scales laid out for bass guitar players is one of a kind! This ebook is laid out for 5 string bass (tuned: B E A D G). If you're looking to break out of the standard Major, Minor and Pentatonic scales then this encyclopaedia will inspire you. 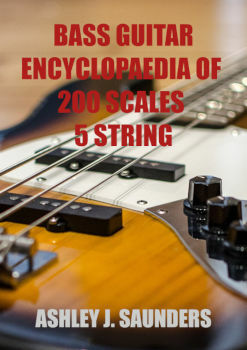 Bass Guitar Encyclopaedia of Scales eBook: 5 Strings is a fantastic collection of 200 scales, displayed for 5 string bass (tuned: B E A D G). 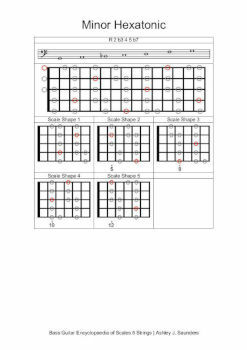 Perfect for bassists who want to expand their harmonic understanding and explore the fretboard. 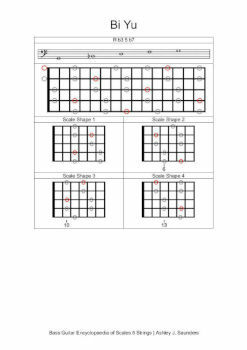 You can use this eBook straight away as each scale is shown in the key of G. In addition to full notation, the scale is written out across the whole fretboard. And where possible, the scale shapes have also been included. Here are just a few of the scales included in the book: Algerian, Gypsy Hexatonic, Mela Pavani (India), Pseudo Turkish, Ryo (Japan), and Zirafkend (Arabia). As you can see, you will quickly move pass all the scales you've played thousands of time already and discover a whole new range. This bass guitar eBook is aimed at those who want to develop their knowledge of scales and how they can be applied to the 5 string bass.